The latest fitness tracker with color display and more function,help you keep energetic and healthy Life. The main function of fitness tracker. Automatically measure your blood pressure(including systolic blood pressure and diastolic blood pressure) and blood oxygen values. Set silent alarms on the smart band to wake you up. Automatically monitoring the quality of sleep everyday ,calculate the length of deep sleep and light sleep. Never miss any calls ,messages and notification from Facebook, Whatsapp, Twitter, Twitter, Linkedin,etc. Support 30 meters deep waterproof, Swimming in the pool and walking in the raining. All of our fitness tracker have 3-MONTH WARRANTY. If you have any problems about the product quality or operation doubts, please contact us via email, we will try our best to solve the problem. 1.STYLISH & Color Screen DESIGN:Fitness tracker with color screen,you can see the screen clearly in the sun or in the dark.Cool design and colorful band suitable for everyone. 2.HEART RATE & SLEEP MONITOR :Check your heart rate and blood pressure automatically to help you do exercise scientifically.Sleep Monitor automatically tracks your sleep duration and sleep quality. 3. MESSAGE& SEDENTARY REMINDER:Remind call,some app daily notifications ,never miss calling and messages.Sedentary Reminder automatically reminds you to walk or exercise after long time sitting. 4. 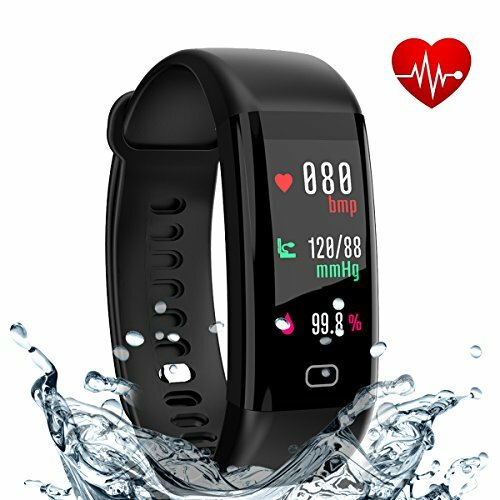 MULTIFUNCTIONAL FITNESS TRACKER:Track all-day activities like steps, distance, calories burned, floors climbed and active minutes.Shaking the wristband off to take picture .Smart anti-lost function help to reduce the rate of loss mobile phone . 5.USB CHARGING & WATERPROOF:Full charge requires only about 1-1.5 hours and the standby time can be up to 5-7 days with full power.Great IP68 waterproof ,we can wear the fitness tracker when swimming ,taking a shower. If you have any questions about this product by Eway, contact us by completing and submitting the form below. If you are looking for a specif part number, please include it with your message.